Peter Gregson and I had an idea yesterday. Imagine a concert venue where each audience member could make their own real-time live mix of the show they were attending. It would start with a typical music venue. Elevated stage and big space for the audience. But the entire stage is behind a thick glass window, like a recording studio, where the musicians are visible. Their individual channels of audio are fed back into the audience, one for each microphone or input. Underneath each audience seat is a little computer to do mixing, processing, and recording. The audience member is wearing headphones and controlling the computer with an app on their phone. The app has the instruments labeled, with little volume, EQ, and effects sliders for each. 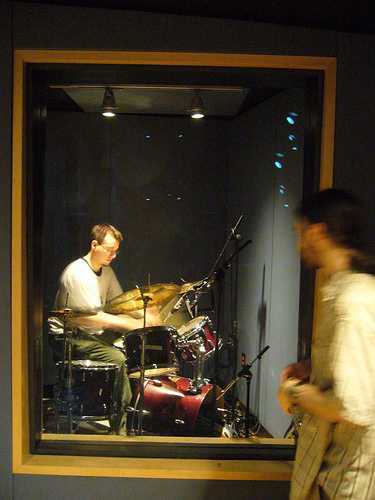 An audience member could mute the guitarist, put a lopass filter on the drums, an envelope filter on the bass, and some crazy echo on the vocals. It doesn’t matter what they do, because they’re the only ones who can hear it like that in their headphones. There is no PA system. There is no definitive mix. The venue is silent. Each audience member is hearing a different mix of their own creation. Everything they do is recorded to the computer underneath their seat, so when they’re done, they can get a USB stick with a good stereo copy of the mix they made. The band also gets to collect all of these mixes after each show, in case they get any new ideas from hearing their music reimagined by strangers each night. The band can release any mix as long as they credit the audience member who did it. The artist can choose to release the tracks under a Creative Commons license for either personal or commercial use. It’d be a niche afficianado music fan who would come to a concert like this, since they wouldn’t do the usual shouting over the music to their friends. Maybe it’d be more like going to a movie, where you experience something with your friends, even though you’re not talking through it. Some people would love to come for the education. They’ve never heard instruments in isolation before. By watching the musician on stage while mixing them, they can better understand each instrument in a way they can’t when mixed in with everything else. Some aspiring engineers and remixers would come to show off their creative mixing skills, in hopes of impressing other music fans or even the artist. Some big-name artists would enjoy playing this venue for the unique experience of it, knowing they’re playing exclusively for serious music-geek fans who will be appreciating their performance with an intensity that a typical audience does not. A city like New York, LA, or London has enough tourists and musicians that an odd venue like this could stay in business. Anyone want to do it?